The hardest thing about mapping is coming to terms with a simple fact that there is no right answer. Mapping enables you to observe the environment, the constant flow of evolution and moves of other players but it won't tell you what to do. There are alas no simple steps for you to follow to success. There are no plans that guarantee to bring you a fortune. I face this obstacle regularly when companies ask "how will mapping benefit me" to which the answer "it depends upon what you observe and then what you do" is seldom welcome. They often want the concrete, the definite and a world of levers you can pull or buttons you can press. I long to say "By turning this mapping dial you will save 12% of costs" or "press the mapping button to increase your rates of successful innovation by 34%" but it just isn't true. The benefits are context specific and they depend upon you. 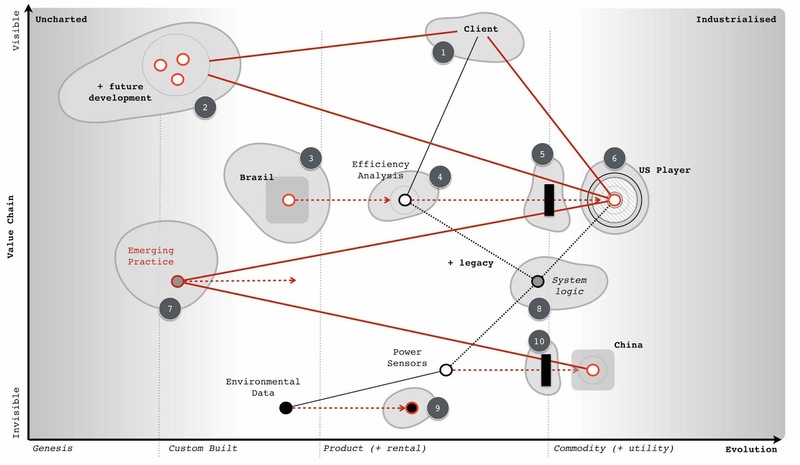 The journey of mapping is one of abandoning the simple mechanistic world and embracing an iterative path of learning. Yes, there are patterns we can learn. Yes, there are universal principles we can apply. Yes, there exists context specific gameplay we can use. Despite this and in spite of our ability to observe the environment, it is still awash with uncertainty. The uncharted is uncertain, the timing of various patterns are uncertain and the actions of others are uncertain. Even the future value of something is inversely proportional to the certainty we have over it. The more uncertain, the more risky and also the more potential value. 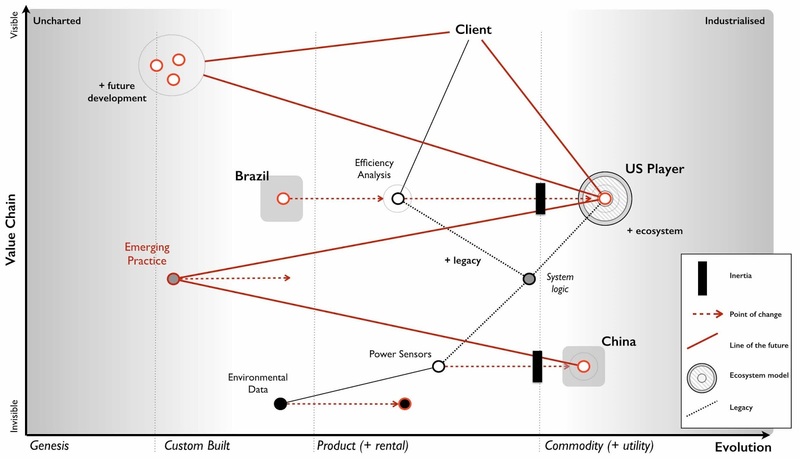 Evolution itself, the very heart of these Wardley maps, can't be measured over time and instead we have to measure over certainty. This use of uncertainty is an intrinsic part of learning to map but as any map shows, not everything is uncertain and even the uncertain can be exploited. Fortunately nature has provided us the ability to cope with this, to be resilient to and learn from a constantly changing world. This ability is known as cognitive reasoning or in layman's terms the application of thought. We can use the patterns and our understanding of the landscape to try and create a more favourable result. Sometimes we will get this right but more importantly, sometimes we will get this wrong. Every failed attempt is an opportunity to learn, assuming we use a systematic method of learning. Every mistake learned can be taught to others, assuming we use a common method of communication. There is a lot of future value in error. By learning these patterns, it helps us constrain the bewildering number of possible moves to the adjacent probable. Hence we can say that the industrialisation of artificial intelligence to commodity components and utility services will enable a rapid growth of new things built on top of them. We just can't say what those new things will be but we can prepare for it. 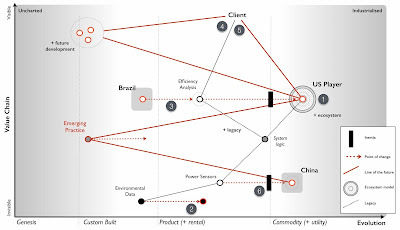 Sometimes the lessons learned from mapping are nothing more than "Ere be dragons" such as the uncharted space will contain highly risky and uncertain sources of future value that require us to experiment, discover and gamble. 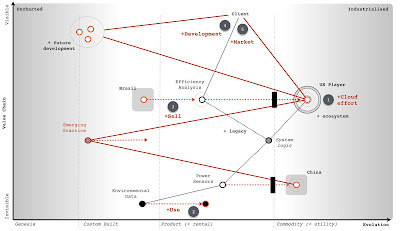 Other times they are more concrete such as the the shift from product to utility will result in co-evolution of practice. Embracing this spectrum from the uncertain to the certain, from the unknown to the known, from the uncharted to the industrialised is for many the most uncomfortable bit of the journey. So to the exercise at hand. I will explain with maps my reasoning to the choices that I would make in this scenario. My reasoning is not the "right" answer but instead it is simply "my" answer. It maybe the case that you read this and say "I wish I'd thought of that" or maybe you have a better answer in which case I'd be delighted to learn from you. Challenge, communication, learning and embracing uncertainty are the very core of mapping. As discussed in chapter 13 - Something wicked this ways comes - then the strategy is about as daft as you can get it but to cap it all off, the company itself has serious flaws in its makeup and composition. This is a company that the CEO supported by the executives is boldly charging the army over a cliff whilst trying to get rid of the one person who might possibly save them - the former CIO. To work through this, we need to first distinguish where we could attack. The problem is, there's lots of areas we could attack even on a simple map like this. It's much the same with a game of chess, there's usually a huge number of potential moves you could make. The trick is sorting out where to go. 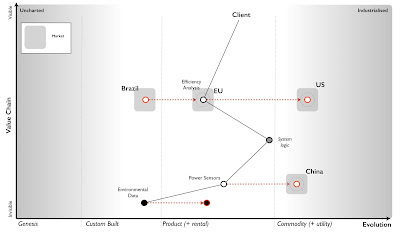 In figure 183 I've listed the obvious wheres on our map ignoring the more wishful thinking such as "buy up the Chinese sensor manufacturer". focus on marketing towards our users. 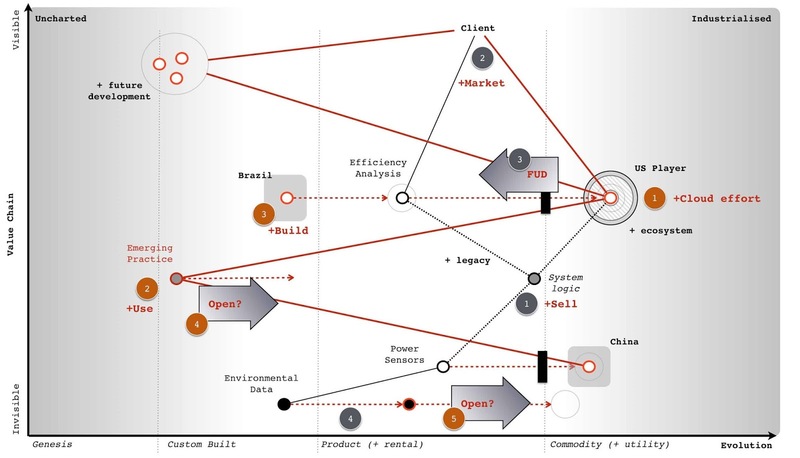 develop new and uncertain capabilities. 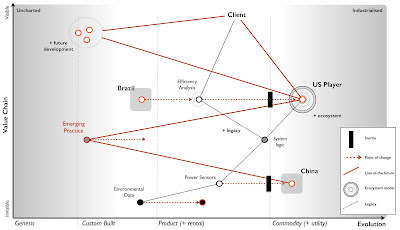 exploit inertia in the industry around the China sensors. That said, they were motivated. It's a judgement call here as to whether an organisation can be altered in a time frame that enables you to exploit an environment. In this case, given the principles exhibited then I'd say not. There isn't enough time to alter the company and go head to head with the US competitor, this is a battle better withdrawn from for now. However, I have several secret weapons. First, the US competitor is using the same expensive sensor and they probably have their own internal inertia to change given their success in the US which means their code base will become legacy. Secondly, just because I can anticipate the future situation then that doesn't mean the market can. From the analyst reports and interest in acquisition we know that Phoenix is seen as a bit of a star in the market. We have that CIO who shows some promise, some insight, despite the company's attempt to get rid of her. Applying a bit of thought, another path now becomes available or in this case two paths as it's a combination of simultaneous plays. I've marked these in orange and grey on the map in figure 185. "I agree on the marketing push in our existing market and focusing on our product development. I share your concerns over the security issues of cloud and the competitor being forced to eat their own ecosystem. I wouldn't like for us to be in that position. I'd like us to scale back on our cloud project for the time being and run a few small scale experiments. I do like the idea of entering the Brazil market but right now I think we need to concentrate on the European market, I wouldn't want us to lose ground to the US player because we're focused elsewhere. However, I completely agree with the efficiency drive and removing the in-house capability regarding the dataset. I also agree we should watch the Chinese sensors but our focus needs to be on building up profitability within Europe and making Phoenix soar." I'd also have a quiet chat with the CEO about the problem CIO and offer to move her to another group in the conglomerate in order that the CEO can focus on the task at hand. I'll also offer to take some of those un-needed IT people as well. My real goal here is pig in a poke, I want to maximise the capital returned through the disposal of the subsidiary. Before you state that no-one in the market would buy Phoenix then print out the the scenario (chapter 12) and try it out on a group of executives. To make your life easier, I've provide a link to a pdf of the scenario. 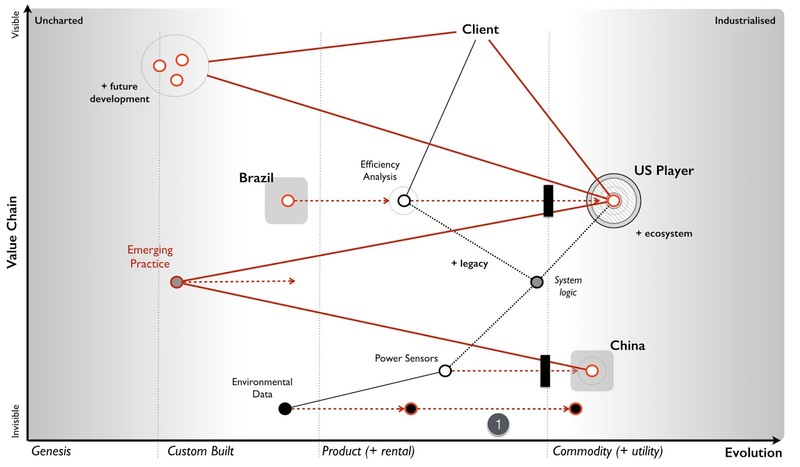 If those executives don't know how to map, they'll probably choose the cloud, Brazil and efficiency efforts around data. If you talk to them about whether they think Phoenix has potential, then most will say yes. These are the people you'd want to be selling Phoenix to. Whilst the grey play is all about making significant capital through a disposal of Phoenix, the orange play is all about building the future. 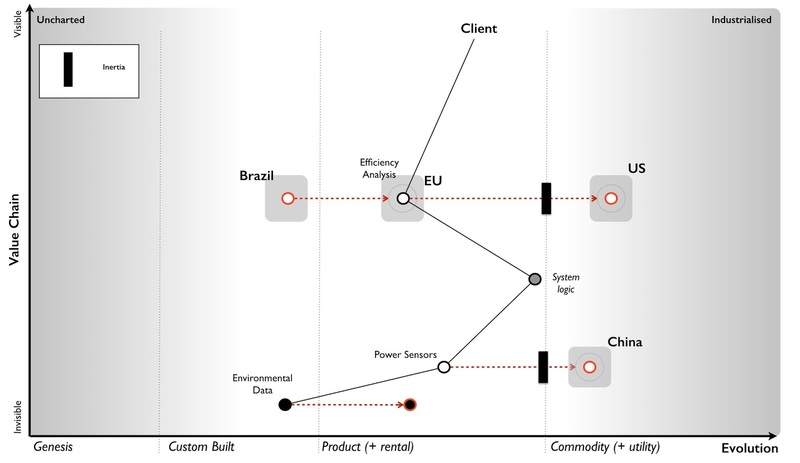 I do want to build that cloud service (orange point 1) but I want the technology based upon the emerging practice that will develop around the commodity sensors (point 2). I'm going to create a secret project, a separate subsidiary to do this and I'm likely to put the CIO I've just nabbed in charge. I certainly also want to consider looking at driving these emerging practices to become more standard through an open approach (point 3). 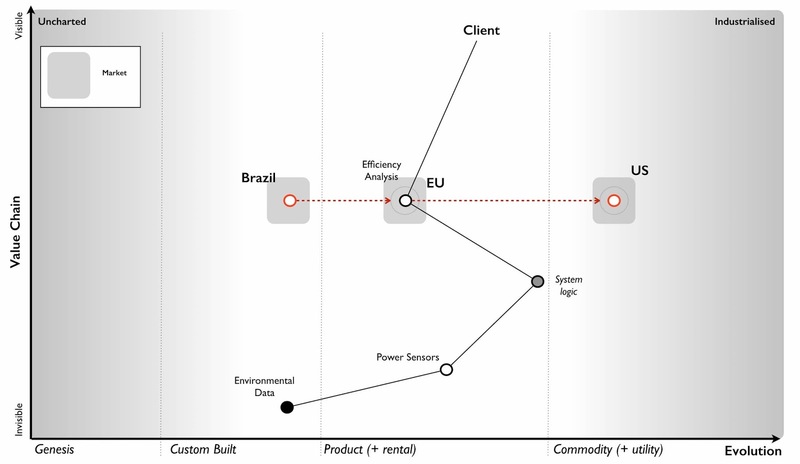 I won't be building the service in Europe but in Brazil (point 4). Once established there and after my disposal of the Phoenix subsidiary then I'm going to look at expanding from Brazil into Europe and the US by exploiting the weakness of the competitors (i.e. their legacy code base based upon expensive sensors). 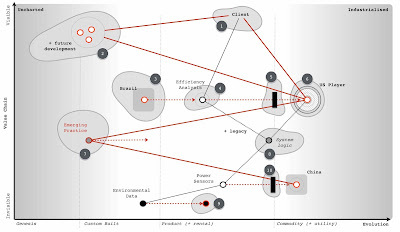 For good measure, I'm going to look for another ILC type ecosystem play around the data (point 5) using an open data approach. I'm going to be spending some time on this new subsidiary, making sure it's setup right and we don't get a repeat of Phoenix. I'd be looking for cell based structure, use of attitudes, FIRE, willingness to challenge and all that good stuff outlined in doctrine. To begin with, I need four basic teams (see figure 186) which I'm going to have to flesh out pretty quickly but I'd be hoping that the CIO will help me nab a few of the right people from the data group that Phoenix wants to remove. This is how I would play the game in order to maximise the benefit for the conglomerate. However, this play took me 45 minutes. I'm sure with a bit of effort then a better play can be found. Maybe you have it? I'm willing to learn. The above play feels a bit "sneaky". Remember, your focus is on what is of benefit to the conglomerate and you never know, Phoenix could have a glorious future. In cases like this, you need to put away concerns over the subsidiary and be true to yourself. Give them a chance to explore their own future in the comfort of someone else's purse. Don't lie to people, even the words I've put down for the CEO contain no lies. I've just omitted my own concerns which he wouldn't share anyway. If I thought those executives might then maybe I would take a different path. Remember, the above play could be wrong, you may be selling of the golden goose which is why you'd need the rest of your executive board to challenge it. Also, it's not "sneaky" to sell of something that you believe will head over the cliff to another. They may be able to see something you can't and you're not responsible for them - caveat emptor. It's also not "sneaky" to emphasise Phoenix as the future, those analyst have been making positive noise in the scenario and maybe they're right. 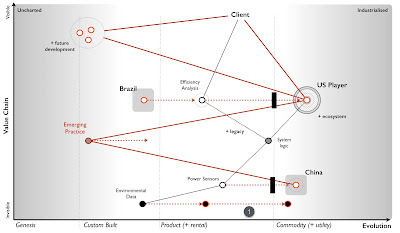 Before they could map, the response was always towards building the cloud service. After learning to map, the response shifted to selling the company ("other"). 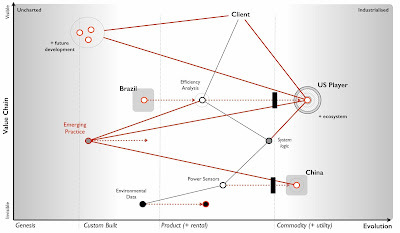 The interesting thing to note is the scenario has many common tools used in business - a P&L to an overview of the market - but the addition of mapping changed the response significantly. The real question to ask is how many past decisions made on those common tools would have been different had they used maps. I'm not going to go through how the DNC lost the election other than to say the DNC farce has just turned up the dial to 11. Trump used confusion to excellent effect in the campaign. I don't like a large amount of the things he says but I won't dismiss his skill, he has shown himself to be very capable. He didn't so much win the election as not do as much damage to himself as his opponents did to themselves. But during the election he made some big promises, the biggest of all and the one that is his signature is "Make America Great Again". The problem for Trump is that isn't solely his choice. Greatness is always relative and he has significant and skilled opposition in China on this front. Fortunately for him, there's a get out clause - the Democrats. In the first few days, as Trump promised, there has been a flurry of executive orders. Some are interesting from the point of competition (e.g. removing TPP), others are damaging (ACA) whilst more still are downright unpleasant - the enhanced Mexico City Policy, enhanced interrogation et al. Amongst this is a bit of the showman such as building the wall. However, Trump is successfully reinforcing his image as a man of action and at the same time he is inviting the Democrats to resist, to protest and to try and prevent the changes. He's not quite saying "Democrats, resist me!" but it's pretty close. Why? Because he will need a fall guy, someone to point to and say "I was ready, I did what I said and what the American people asked, I was their leader and their man of action BUT these people [point, point] stopped me from making America Great Again". It's a terrible trap. If the DNC don't resist then people will blame the DNC for not doing enough to stop Trump if it goes bad. If they do resist then Trump (and his supporters) will blame the DNC for resisting if it goes bad. If things go well then Trump will claim he was right regardless of whether the DNC resisted or not. What they should be doing is tearing him down on that one signature promise that he made. This means, the best route (baring the ability for workers to hold a general strike which seems highly unlikely) for the DNC is to stand firm, not obstruct him but to hold him to account. He wants a wall, build the wall. He wants a freeze in hiring, then let the freeze happen. The question the DNC need to be constantly asking him is "When is America going to be great again? That was your promise." You need to expose him on that question of leadership and what he stands for. Oh, but we can't support his awful actions! Well, some of them are unpleasant, some are worse and many might get you angry. I'd imagine they're even meant to do this, to get some people to react and to resist. By all means challenge them, question their legality, expose them, use the courts but don't just resist Trump by trying to use political process to thwart him. You'll fall into the trap. You need to bang that drum on "When is America going to be great again?" and hold this representative to account on his promise. Before you say - I didn't vote for him - whether you like it or not, he is the democratically elected president of the US. Again, that might make you angry but those who have the right to vote need to use democracy and the will of the people to their advantage. That means bringing lots of other people to your side. Remember, he did win which means he has lots of supporters. By all means, make your feelings clear, show support to any victims but try and encourage his supporters to join you which means listening to their concerns. Give in to your anger, run around calling them "Nazis" and celebrate people punching them is a surefire way to lose. Don't let them use your resistance against you, as a way of maintaining power. Gather your support. As uncomfortable as this might sound to many, Trump is being pretty true to his word. But that's also to your advantage. Bang that drum - "When is America going to be great again?" But what about the people suffering under the uncertainty now? I feel huge sympathy for them, it must be awful. I feel the DNC has let down so many by the way it ran the campaign but there's no comfort in that. Alas, also true to form, the Democrats and others are talking about resisting Trump and the media is getting in on the act. It's almost as if Trump wrote their script for them and it's sadly hilarious in the sort of hold your head in your hands and cry sort of way. There's also another question here - who is actually writing the script? But that's for the US, we have our own problems in the UK. Whilst Jeremy Corbyn is spot on not to resist the passage of article 50 and to play the game of holding the Government to account, we have the same calls that Labour should "resist". There are times to resist but this is not one of those. I do notice that some of the same papers that are calling for Labour to resist are also being somewhat gushing over EU trade agreements. Well, if you want something to resist, you feel that urge to vent then don't resist against your own democracy but in favour of it. You should be holding no punches on the EU (more specifically the EC) and their attempts to introduce a global ISDS (the bit we all rallied against in TTIP which threatens the future of the NHS and our sovereign rights). We should be standing shoulder to shoulder and joining the rebel alliance with India, Brazil, Japan and Argentina by telling the EU a polite but firm "no". We should expect our MPs to respect our democracy, our sovereignty and our NHS and stand firm against this. Over the last day we have had a huge outpouring of anger online over the immigration changes in the US, described by many as the "Muslim ban" i.e. the executive order on protecting the US from foreign terrorists. 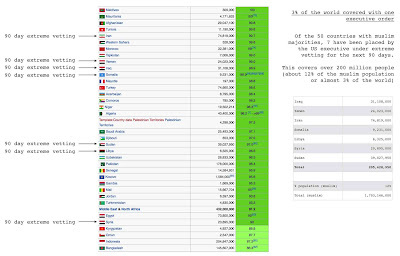 If you have questions on the religious aspects of this, please read section 5 and consider the impact of "religious minority in his country of nationality" for predominately Muslim countries. First of all, this change is one that I fundamentally disagree with especially when it comes to refugees. 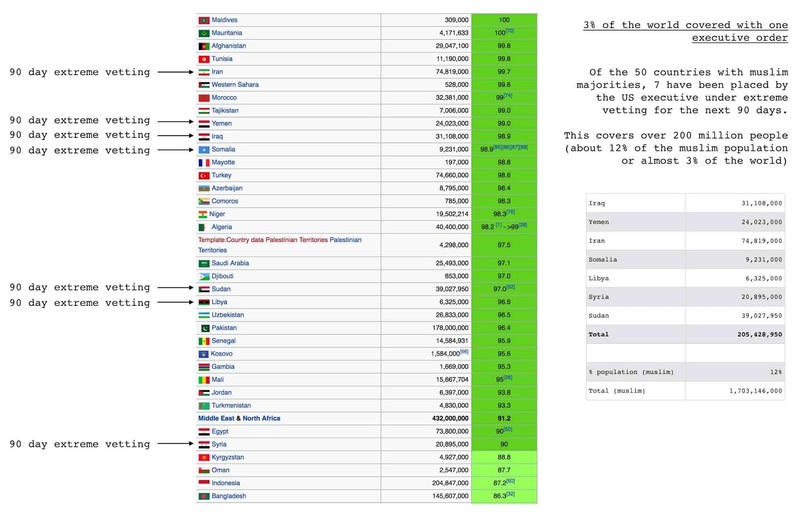 Unfortunately, the response has left the door open (see figure below) for the President to point out that it's a) only effecting a small minority of muslim majority countries b) targeted at states that are considered to be "of concern" c) temporary. So despite this covering 200 million people, tainting populations with a certain image, having an effect on many lives including the 120 day suspension of the refugee resettlement program, expect the official push back to be on those terms. Whilst that's happening, expect some positive news and then a new outage in this cycle of continuous outrage over the next few weeks. It won't be long until people are so outraged that they can't remember what they're outraged at (because of the choice) and people will slowly become habituated to outrage itself. I also happen to agree with the comment below that the outrages are likely to be anchoring and the final position may well be less severe. Furthermore, if things go wrong, any bouts of DNC resistance will have given Trump his fall guy. I hope the DNC wake up and realise they need that drumbeat but I suspect some will soon be in disarray over concerns on limits to terms in Congress. That's also a trap but hey, who's counting. I'm not a fan of Trump (I would have preferred Elizabeth Warren or Bernie Sanders) but I have to admit, Trump is skilfully playing this despite the damage it is causing. 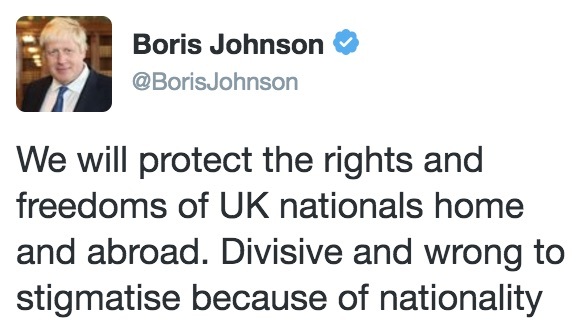 The UK response to this is textbook. The Government is being firm, polite and conceding no moral ground to Trump on what has happened. 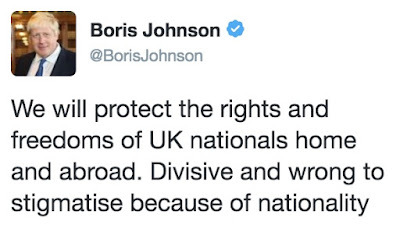 As close to a ticking off as you could hope to expect from a diplomat. Personally, it's not a strong enough message. 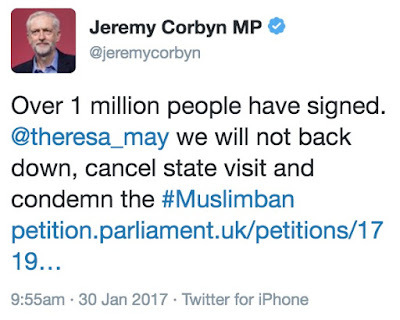 Fortunately the opposition (and the marvellous Corbyn) is making the feeling clear. The DNC, without trying to thwart Trump through political shenanigans (you'll just get labelled elitists) should simply start banging that drum and asking "When is America going to be great again?" Try to gather support, to reach out and listen to others concerns. Yes, you want to build unity but with as wide a base as possible. Try to build a vision of hope, be firm about disagreeing with the executive orders and start asking that question - when? Asked about the "cycle of outrage". 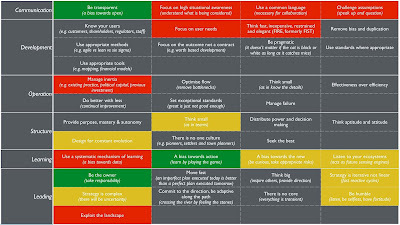 I'm using plain old OODA (observe, orient, decide, act) here. The purpose is to move faster than your "opponents" OODA loop in order to disorientate and demoralise them. It maybe coincidental that this stuff is hitting fast, that there is misinformation, misdirection and misunderstanding. The sudden hit of the outrageous (anchoring), the outrage explodes, the confusion of mixed message and then there's a less outrageous part which somehow seems more reasonable (regardless of whether it is or not) but before you can decide ... new outrage! The DNC needs to get its act in order. An excellent post by Lawrence Lessig on Rules for a Constitutional Crisis -"The citizens who elected Trump are not evil. And if America is going to survive this crisis, we need to convince them first that their President should not be President" - in other words, win hearts and minds. 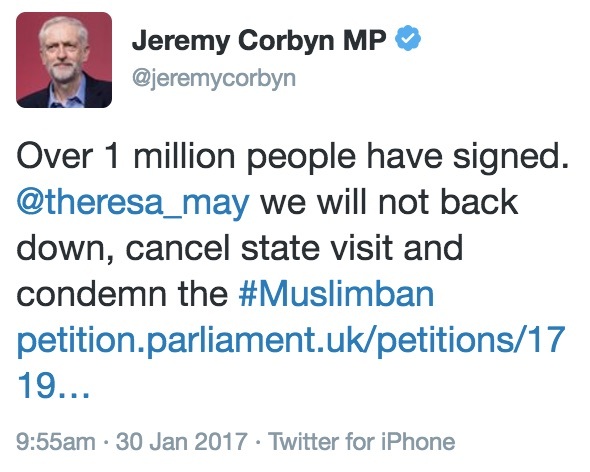 The comparison of Trump to the Enablement Act and the horrors of the 1930s, the description of the UK prime minister as "Theresa the appeaser" goes beyond the pale. I view this travel ban as highly discriminatory, misguided and worth condemning but comparison of the US to the Holocaust are truly offensive. Please stop. The emergency debate in the house of commons on the changes to US immigration policy is exceptional and well worth listening to. The right honourable Nadhim Zahawi and Ed Miliband make the case that this executive order is counterproductive. A new executive order to cut business regulation. I suppose we can describe this as the "positive" respite. I note also the "Get With the Program or Leave" comments. I was asked the question "Where do you think Trump is going with all this?" to which I'll respond that it's not clear to me yet. I am very wary of some of the actors involved. I was asked "Should people protest?" - of course, it's your democratic duty to protest, to make your feelings known in peaceful assembly. There's a world of difference between the public protesting or other Government's making clear their dissatisfaction and the DNC trying to resist through political manoeuvres. I'd like to see the DNC holding the administration to account, banging that drum and building a broader church of support. The airwaves are being filled with noise that the DNC is going to try to filibuster and boycott. Oh, please no. A clear statement is needed to counter this. Whether the reports are true or not doesn't matter, as the narrative of the "man of action" taking on the "elite establishment" will be reinforced. I would imagine the next "outrage" in the cycle will soon make its entrance onto the scene. Ah, lets bop that Dodd-Frank act shall we. Berkeley ... let us not talk about it other than to say it's depressing. On the upside, at least one professor from a Naval War College had something sensible to write on the subject of Trump - "Constant panic undermines his critics and boost his base". It maybe unlucky for some but I'm going to start this chapter by announcing that I'm not going to give you an answer to the scenario - yet. Instead, I'm going to give you some analysis just in case you're needing a bit of help. If you're some wizard that has already worked through the scenario, determined the right strategy and have a solution then that's fine, you can skip unlucky 13 and head straight into the next chapter. This is more for the rest of us mere mortals, who like me, have found themselves totally lost when faced with problems such as the scenario. I'm not going to use any additional information other than that already provided - in other words, there's no mystery character inserted in the last paragraph that committed the crime, see all those loathsome detective novels that make you go "where did that come from?" I'm also going to explain this analysis in quite some detail. I apologise in advance if this is tedious but I've spent a lifetime reading mathematics texts which go - "it is therefore obvious that" - only to continuously discover that it's not obvious to me. I am going to start by creating a map of the environment and use it with some of those basic climatic patterns. I'm also going to add in a bit about market position, that'll become clear as we go through. Remember maps are just a communication tool and so feel free to annotate and adapt them as you need. 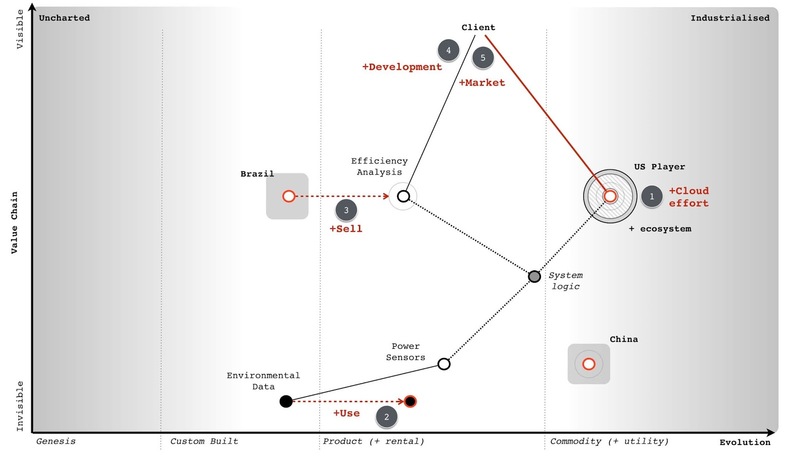 From this basic map, we're going to examine the state of the company and its proposed strategy. We're finally going to use time-turner magic (for all you Harry Potter fans out there) to wind the clock back in time and give you a chance to choose your order again and decide once more what you want to say to the executive board. To start with, we need to create a basic map. The company unfortunately doesn't talk a great deal about user needs but we can infer that the user need is either about saving money or being green (possibly even a legal requirement). 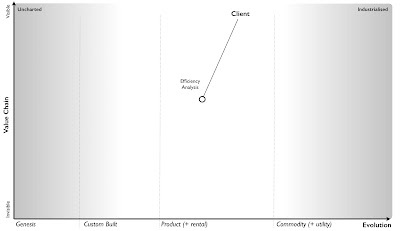 This need requires some form of efficiency analysis which is provided by the company as a product - Phoenix. We also know the market whilst reasonably sized (£301 million) is seen to be far smaller than the applicable market (£3 billion) and so the market of clients is not yet fully mature. Hence to begin with, I'm just going to add client which needs efficiency analysis to our map and position the pieces roughly where I think they should be (see figure 167). I also know that Phoenix requires some form of sensor and this sensor seems to be a highly expensive product. The clue that this isn't some form of resource constraint is that a more commodity version is provided in China. I also know that the sensor (or at least the system using the sensor) requires some form of custom built data set which our own in-house IT team creates. I'm not quite sure how this operates but for the time being I'll attach this as a need for the sensor. Finally, I'm aware that Phoenix has some form of system logic based upon best practice use of the sensors. I know that changing the sensor to multiple commodity sensors would "require a complete rewrite of Phoenix" (the CDO told us this). 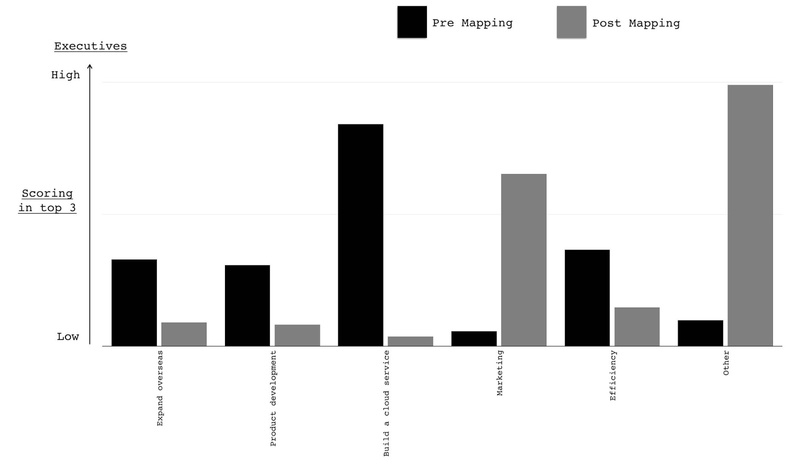 So, I can now extend my map with these components (figure 168). It's not perfect, no map ever is. I've marked on the sensor logic as a practice (i.e. it seems to be connected with how we use sensors) and the environmental data as data. 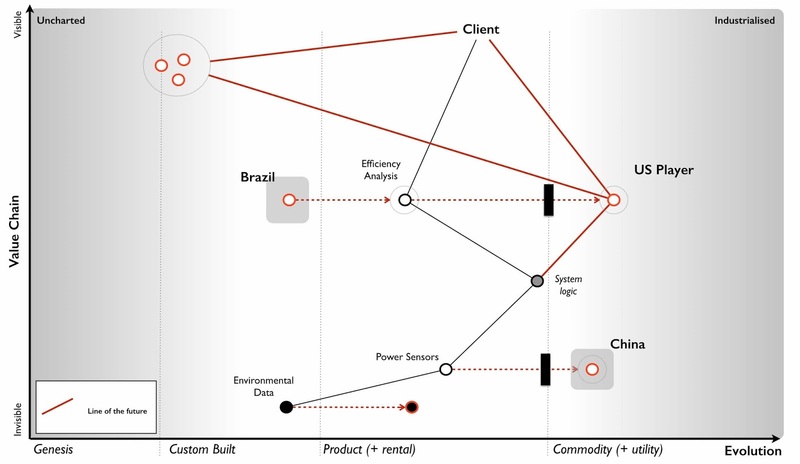 The head of marketing also told us that the US was a more mature market and Brazil was less developed in the area of such efficiency analysis software. I'll assume that the markets are competitive (i.e. 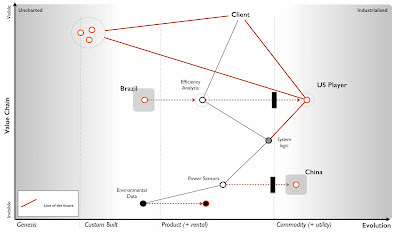 there is supply and demand competition) particularly since we're talking about setting up a business in Brazil. It's a bit of a gamble but I'll assume that the head of marketing has done at least a small modicum of homework. We can now mark on these markets, with lines (red dotted) to describe how they are changing - see figure 169. 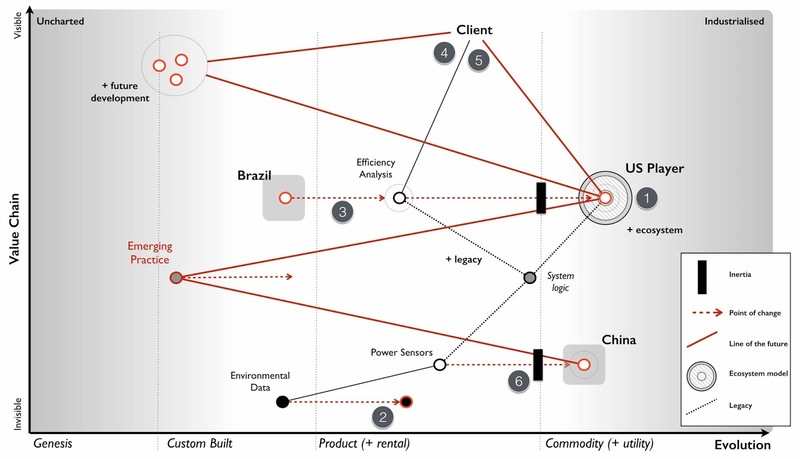 We also know that a range of "more commodity like sensors" have been launched in China and that there is now a "data set available on the market" which I'll assume is some form of product or rental arrangement. Obviously there's a couple of assumptions here but these could be clarified with a few questions. I've marked on these changes to the map in figure 170. Now, whilst it might not be a perfect map, it does provide us some form of overview on the environment and certainly something we can use to challenge the assumptions I've made. There is however a bit more to add. We can infer from the comments on the US competitor, the company's plans for Phoenix's own cloud solution to represent a mere 10% of revenue by 2023, their pride at the "technological marvel they have created" and the statement that "security concerns cited by some clients due to their cloud approach" that this group will have some inertia to the cloud change. 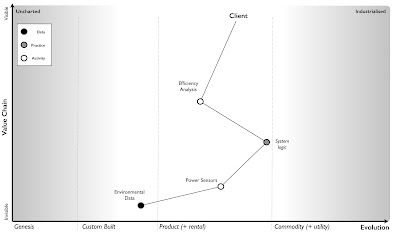 We also know more explicitly that with the commodity sensors being described as "not good enough for the the job" and an alternative path of using "lots of the cheaper sensors" being widely dismissed despite the cost of the sensors, the price differential and customer concerns over cost that we will find resistance to change here as well. We should add this inertia to our map (figure 171). Figure 171 - Adding inertia. In our market, we have a US player that is also operating in the more mature US market. They are already providing features we do not (we will assume this mets some user need which we might possibly not be aware of), they have companies building novel components and potentially products on top of their API and the system they are offering is more of a utility. It's still based however on the expensive sensors and we can assume they have developed their own system logic which is equivalent to ours. I've added this into figure 172. 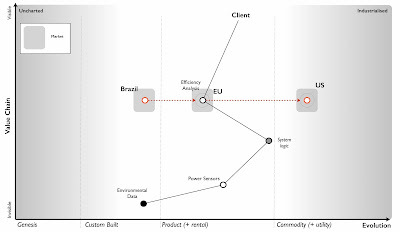 The shift towards more utility versions requires four factors - concept, technology, suitability and attitude (see chapter 11 - charting the future). In this case concept, suitability and technology clearly exist as we have a US competitor providing the service. In terms of attitude then it's a question of whether your clients are dissatisfied with the current method of provision. It's not the 90% of customers rating Phoenix as good to high levels of satisfaction that concern me, it's the 10% who didn't. Specifically, the concern of a "high cost of the system in the market as was noted in the customer survey". I'm going to assume therefore that we are firmly on the path towards utility as the factors seem to be there and a player is already making that move. The US player claims to be "doubling in size each year" and the anticipated revenue growth from £15M to £25M is somewhat supportive of this especially if we consider the potential for economies of scale and price cuts. Alas, we have no information to confirm that consideration. We should note that they have a “fairly active development community" growing around their API and have been accused of "eating up the business models of some of those product companies". Contrary to this being a desperate act of cannibalisation, it is more likely part of an ILC like gameplay (as described in chapter 5 - the decision to act). This is exceedingly dangerous as the larger that ecosystem grows then the more innovative, more efficient and more customer focused the competitor becomes. They are already ahead of us in both utility forms, provision of an API and core features. Let us add this bit of gloom and doom to our map. 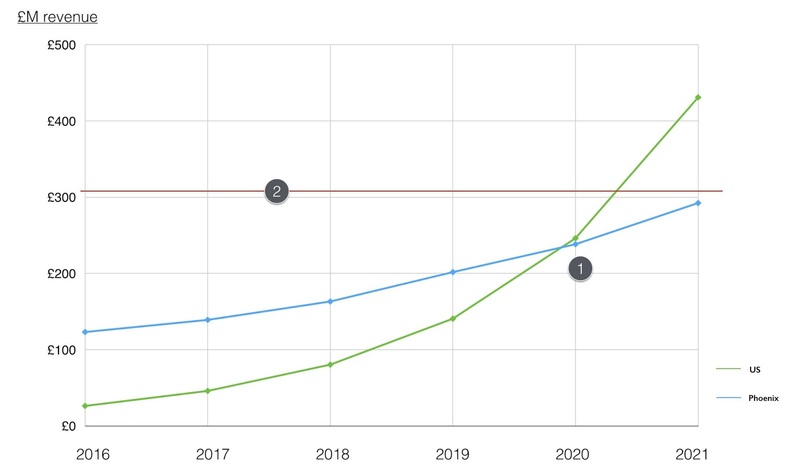 In the "P&L" provided by the CFO we have revenue forecasts all the way to 2021, a very wishful bit of thinking. We know the shift from product to utility tends to demonstrate a punctuated equilibrium and so it's not unreasonable to assume the growth rate of the US player will continue. Added on top of that an ILC model then this growth rate is likely to be reinforced because the US player will extend further ahead of Phoenix. 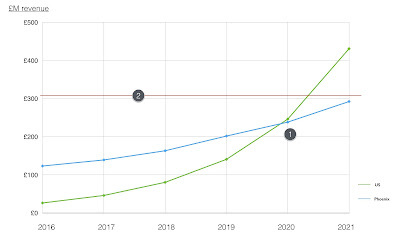 Hence we can add our predicted revenue and extrapolate the US revenue onto the same graph - see figure 174. There are a couple of comments worth noting. First (point 1) is that by 2020 or thereabout the US player will be about the same size of revenue as Phoenix. The problem is the US player will be an entirely cloud based service with a large ecosystem that they are using to sense future changes. Our Phoenix cloud service would have just launched and we will be a startup, a minnow after spending £45 million in a future market that is dominated by this US giant. Even by 2023 our cloud revenue is only expected to be 10% of our overall revenue. This is calamitous. 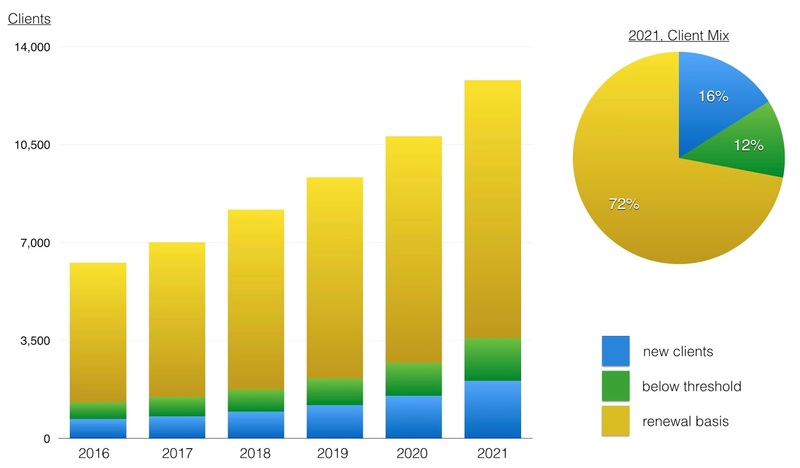 To compound this the current market is only just north of £300M (point 2) and by 2020 then the combined revenues of Phoenix and the US player will vastly exceed this. Even given growth of the current market, we can assume we're going to be head to head in a battle with the US player. One of us is not going to get what we're hoping for. Unfortunately, we will be playing the part of David with our trusty sling versus a Goliath who has turned up with an entire army of brothers armed with general purpose machine guns. This is not going to be pretty for us. Alas it gets worse. In chapter 9 - charting the future - we discussed the concept of co-evolution of practice with activity. 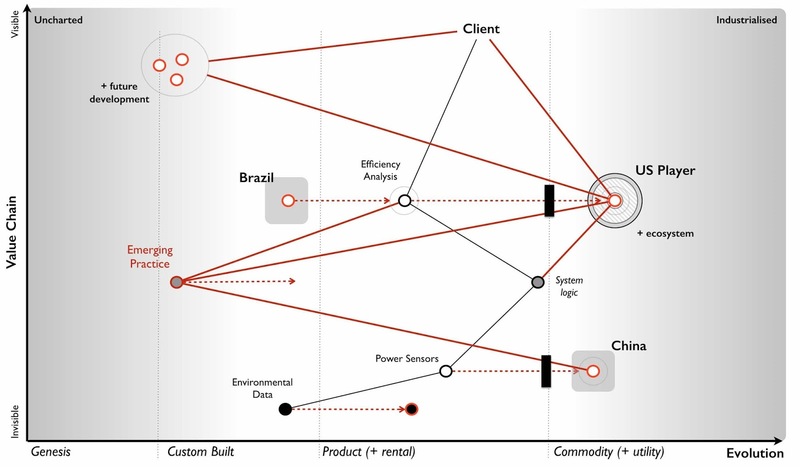 Looking at our map, we can apply the same pattern to sensors. 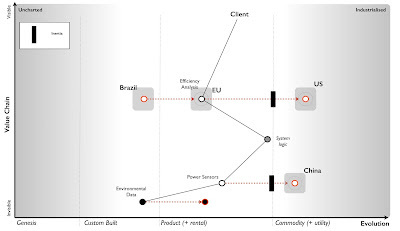 The commodity sensors available in China are likely to trigger an entire new set of practices. Our CIO hinted at this with the statement “a potential solution could be to use lots of the cheaper sensors” which our CDO dismissed with the normal inertia of one wedded to a past practice - "require a complete rewrite of Phoenix". Whether we like it or not, a new emerging practice is coming and our existing system logic needs the rewrite (see figure 175). What this means is not only do we have a future battle with a Goliath but the entire system logic of Phoenix and our code based that is built upon years of good to best practice with these highly expensive sensors is about to become legacy. I've summarised this all in the map below (figure 176) and we will use this to examine the company strategy. Now, you might argue with the position of pieces ob the map or components that have been missed or assumptions that have been made but that's the entire point of a map. To expose all of this in a visual form that we can then challenge. With our map in hand, let us now look at the strategy of the company. I've marked on each point which relates to the strategy in figure 177 and we will go through each in turn. 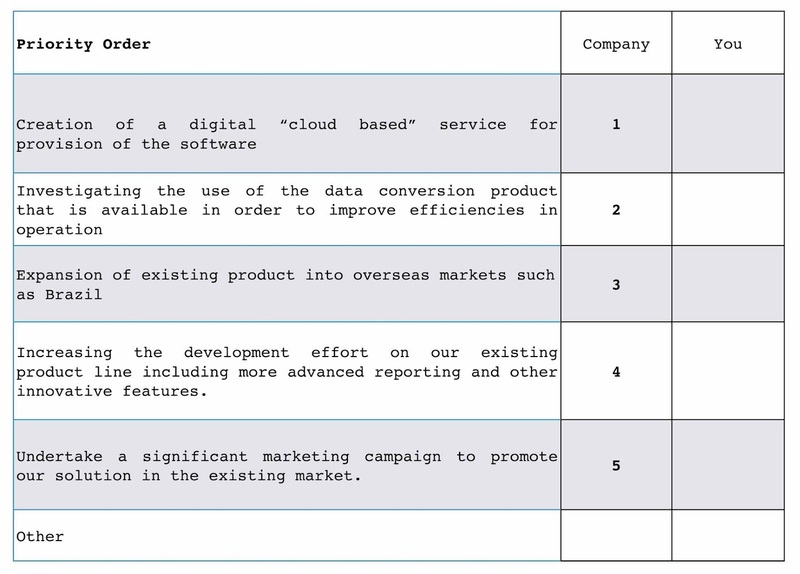 Point 1 : Creation of a digital “cloud based” service for provision of the software. By the time our cloud service hits the market in 2020, we're likely to be a minnow against a giant with a well developed ecosystem model. If they're running an ILC model which seems possible then they will be out innovating us, more efficient, more customer focused and larger. They will be far ahead of us and our cloud effort doesn't even mention building an API or running any form of ecosystem game. To cap it all off, we're even bringing an old licensing model with us and a system logic that is likely to become legacy and replaced by co-evolved practice. In terms of getting it wrong, this is a fabulous way of wasting £45 million. Point 2 : Investigating the use of the data conversion product that is available in order to improve efficiencies and reduce cost. A fairly sensible proposal on cost efficiency but not one that should be high up the priority list in such a battle. 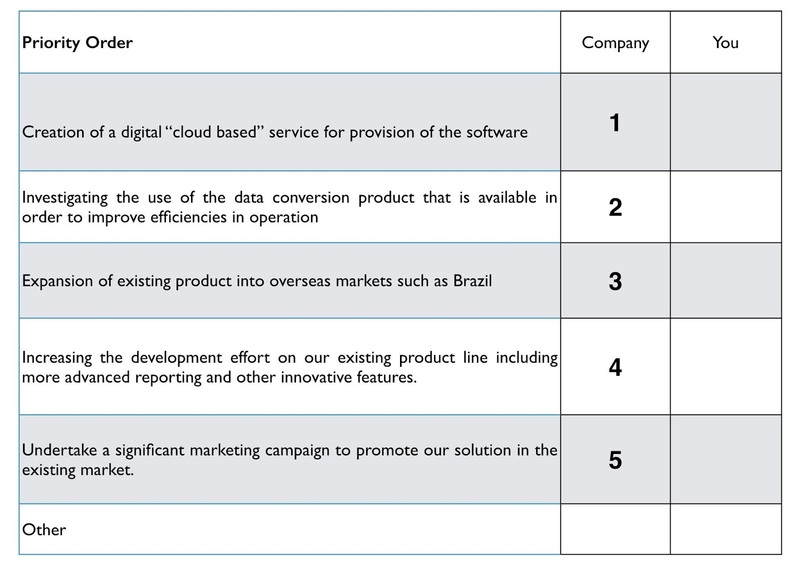 Point 3 : Expansion of existing product into overseas markets such as Brazil. It might create some short term gain but this is also a dangerous path. 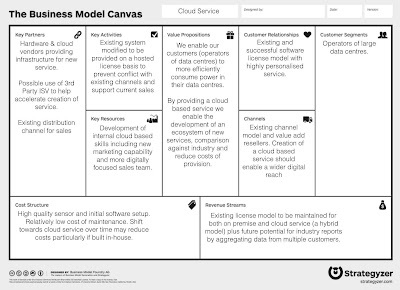 Our business model in a more mature market is going to be chewed up but rather than face this, we're going to take our model and attempt to re-apply it to a less mature or emerging market. All that will happen is our competitor will chew up both markets and we are simply spending money laying the groundwork for them to attack the emerging market. It would probably be more favourable to our shareholders to give half the money to the competitor for marketing in Brazil and return half the money to the shareholders than to build up future liability. This isn't as bad as the cloud effort but this will increase inertia to change due to the belief that the short term gain translates to our past model still being successful. Point 4 : Increasing the development effort on our existing product line including more advanced reporting and other innovative features. There is always value in focusing on user needs but in this case we're not addressing the problem of our competitor but patching over it in the very short term. 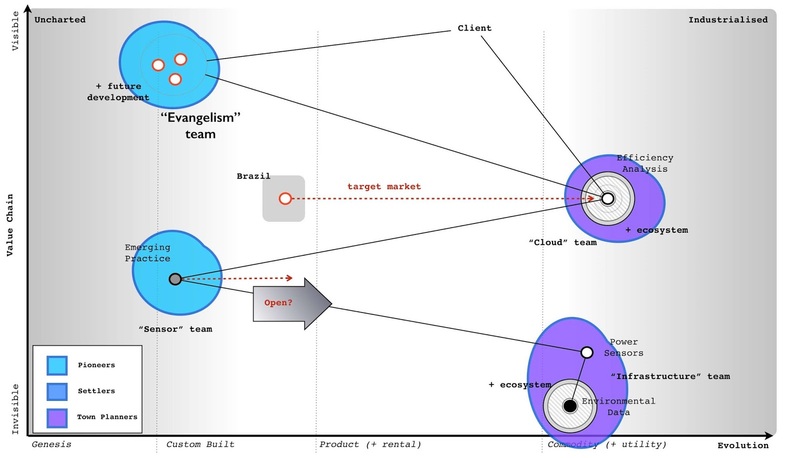 Unfortunately for us, if the competitor is using an ILC model then we are in competition with the entire ecosystem that has built upon the competitor's API. If for example that includes 200 software companies then our poor product development team is going up against the might of 200 software teams. This situation only gets worse as the ecosystem grows. This is a path of spending money and still losing by ever increasing margins. It doesn't fix any of the problems but at least it might gives us a short term revenue boost. If you want to mess up strategy then the CEO has done a glorious job. Fortunately there's also some opportunities to be considered. 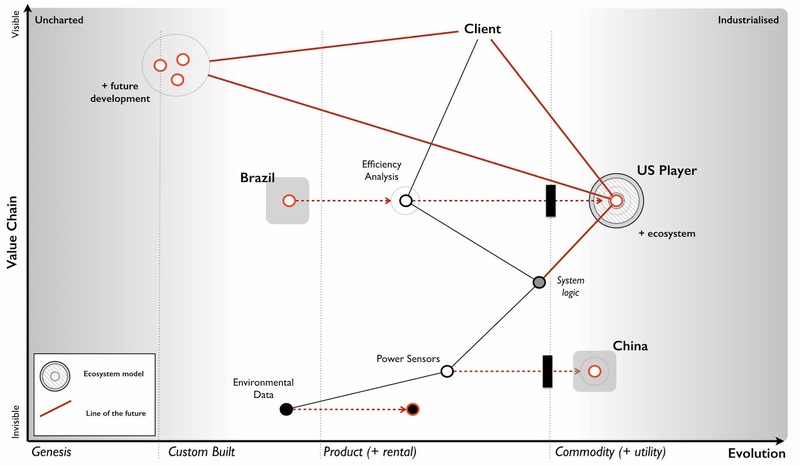 Firstly, the market in Brazil is an opportunity but re-using our old business model might not be the wisest idea. Secondly, there was an interest in acquisition of this company. Just because you know it's a future train wreck, this doesn't mean others do (remember most don't map). As someone who has done a bit of work in M&A then coming face to face with a company hurtling towards a cliff edge whilst there is "positive noise about the subsidiary from analysts and also some interest by third parties in potential acquisition" is surprisingly common and lucrative. You are a board member for the conglomerate and should look to maximise the opportunity. 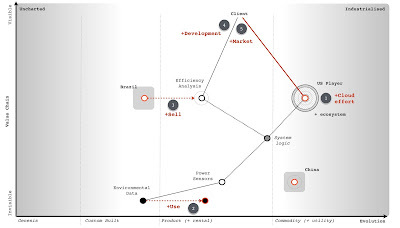 Thirdly, the system logic is heading towards legacy and we will have our own DevOps moment with an emerging practice. Fortunately, we're not the only ones facing this as the US company has the same problem. Maybe they're not as smart as we think? Maybe they're working on a solution? We don't know but this is a potential weakness. Lastly, there's a final opportunity in the data set. Yes, a product is now available but that doesn't mean we can't try and out commoditise this and turn data into some form of utility with an open data play (point 1, figure 178). Figure 178 - Turning data into a utility. The strategy outlined by the subsidiary needs some serious work on it. However, before jumping the gun let us take a look at the company again. The strategy might be bad but the question is whether the company is recoverable in the time frame? When I want to get a sense of company and its ability to adapt, to cope with the unexpected, to learn and to be resilient to competition itself then I start looking at the universal principles it applies. I'm not looking for resilience to known scenarios but our ability to adapt to the unknown and to cope with the flow of evolution. In this case the CEO talks about the values of the company which include "responsibility, integrity, transparency, compassion, empathy, adaptiveness and decisiveness." These values seem all perfectly reasonable, however there are two things to consider. Firstly, companies are often very good at saying one thing and then doing something else. Secondly, executives and consultants are often very good at coming up with simple "truths" that have no data behind them. 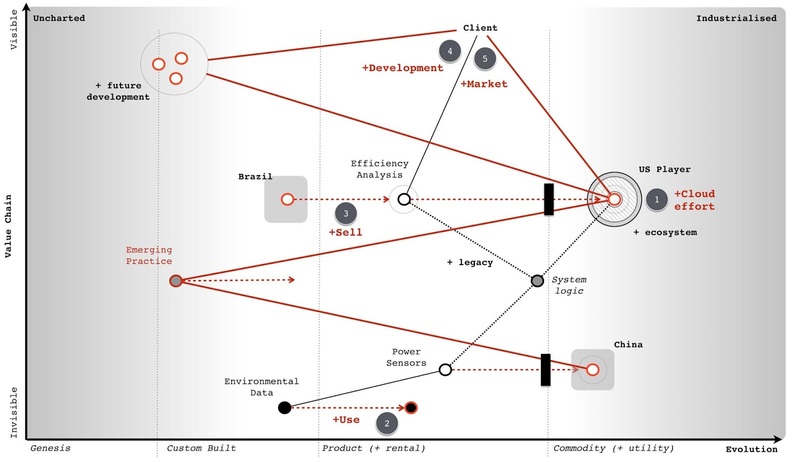 I can only judge this in terms of what I have evidence for, hence the Wardley Doctrine in chapter 11 - the smorgasbord of the slightly useful. For example, let us take empathy. It seems like it should matter, but does it? Is it a universal principle? What evidence do I have that it works in all cases and isn't context specific? Maybe empathy matters more in a care home than on a factory line? I don't know and so I can't judge on this. However, there's lots of things I was told in the scenario which I can comment on. 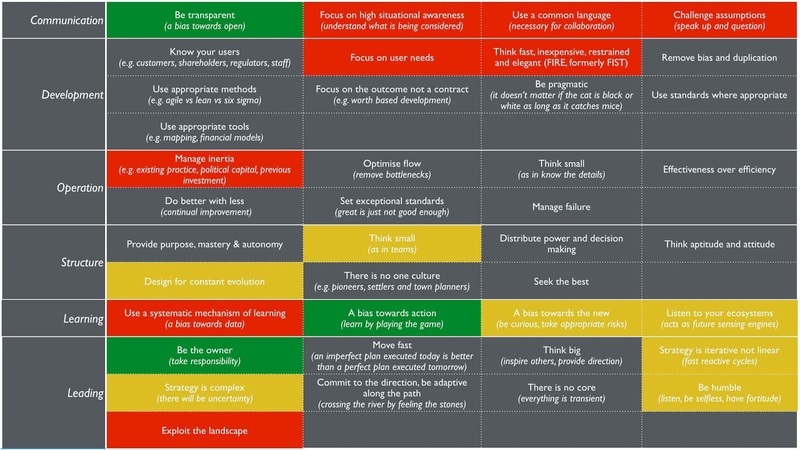 I've highlighted the areas of doctrine in figure 179 using a green (for that warm fuzzy feeling), amber (for concern) and red (potential for setting off alarm bells) motif. When someone talks about how the "organisation was recently restructured" then this is a signal to me that the organisation didn't cope with constant evolution. They may have reformed to a structure which now does but I see no evidence one way or the other. Given the above, the discussion on how the "digital group will expand significantly over the next two years" raises an eyebrow. I'd want to know more, are we talking about a hefty department or some cell based way of operating (e.g. two pizza). The discussion about the sensors and how "it’s worth keeping an eye on the market" raises another eyebrow. I'd expect to see more directed action towards this change. I'm somewhat comforted by the use of the data set. When your customers are concerned about the "high cost of the system in the market as was noted in the customer survey" then a response of "renewal price will be frozen for the next two years" is not encouraging. There is nothing iterative about the strategy proposed. This might just be a reflection of the way it is presented but it's worth a question. There is no concept of uncertainty presented. It's more a set of action statements and a plan which goes far into the future. From "being instrumental to the company’s success" to the quote "some people just have not found adjusting to this new world that easy" to the observation that the company is "clearly proud of its accomplishments, the technological marvel they have created and their ability to deliver against their vision" then there's a touch of entitlement and maybe a bit of arrogance to them. I see no evidence of this and a simple mapping of the environment has raised concerns that are not even discussed. I'd want to see clear evidence the company actually understands its environment. I see an abundance of different graphics but no consistent mechanism of discussion other than verbal stories often laced with terminology. I'd want to understand how we actually communicate. An extremely valid challenge over sensors was given by the CIO but dismissed and even described as being "discussed several times before". The palpable sense of "frustration with the group and the CIO on this topic" indicates a team that is not listening. The answers given to the challenge are all symbols of inertia - pre-existing practice, assets etc. I'd be digging here. The lack of description of user needs is significant. Statements like "The attrition rate has been high in recent years at 9% but the Sales team believes this is due to a lack of new features and a high cost of software license renewal" are all very well and good but I'm not interested in what the Sales team thinks, I'd want to know what the user needs and wants. A £45 million investment on a cloud effort over two years is not what I'd be expecting from a company following FIRE principles. This may be a simple consequence of summarisation to an executive level but I'd want to see evidence that we're not embarking on building some Death Star. Whilst inertia appears to be clear, the only challenge to it (e.g. sensors) is knocked back. In fact the CEO got in on the act talking about intellectual property. I'd want to ask a few more questions here. I see no evidence of this and of past lessons being applied. There's no concept of climatic patterns or learning. I'd want to explore this more. I see no evidence of understanding let alone exploiting the landscape. It might exist in mental models and some form of intrinsic common understanding but I'm not overwhelmed by this. In my analysis, the strategy is barking up the wrong tree and I have significant concerns over the company itself. I would not be confident that this company is either heading in the right direction or capable of adapting to the uncertain future. The only person I have some confidence in is the CIO that the company is so desperately trying to get rid off. But that's me. Your analysis maybe different. You may have seen something I have not. So let us take this unlucky chapter 13, invoke some dark magic and do the time warp again. You have a call in forty-five minutes with the executive board. That’s how long you have to make your choices. The clock is ticking. So find a stopwatch and start it. Your first task is to determine whether the company is heading in the right direction. 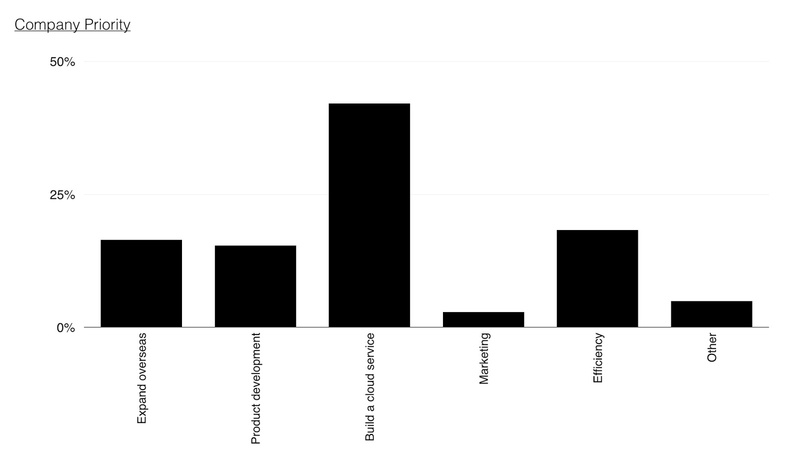 You should determine whether you agree with the priority order given in figure 180. If not, write down what your priority order would be. If you decide to invoke “other” then scribble down what that other is. Once you’ve decided your priority order then your next task is to determine what you’re going to say to the executive board. a member of the executive board of a huge conglomerate focused on facilities management. attending a meeting of one your wholly owned subsidiary companies with their executives. on a fact finding mission, trying to determine what the future of this subsidiary is. There has been some recent positive noise about the subsidiary from analysts and also some interest by third parties in potential acquisition. This company offers a single product which is a software system that monitors a data centre's consumption of power in order to determine whether it is being used effectively. The product is known as Phoenix. The CEO introduces the company and their vision to provide customers with the best tool in the market for reducing power consumption and improving environmental performance. The CEO talks about their mission to "help reduce IT's impact on the planet" and there is noticeably a great sense of pride and self belief within the group. The CEO reiterates their core values in a presentation. The values are described as being instrumental to the company's success and they include responsibility, integrity, transparency, compassion, empathy, adaptiveness and decisiveness. The CEO then provides some background information, more for your benefit than anyone else's. The system involves a proprietary software package which performs analytics across data gathered from a sensor that is installed within a customer's data centre. The sensor is a highly expensive piece of kit that is manufactured by third parties. The sensor monitors both the electricity input, the temperature and airflow within the building. 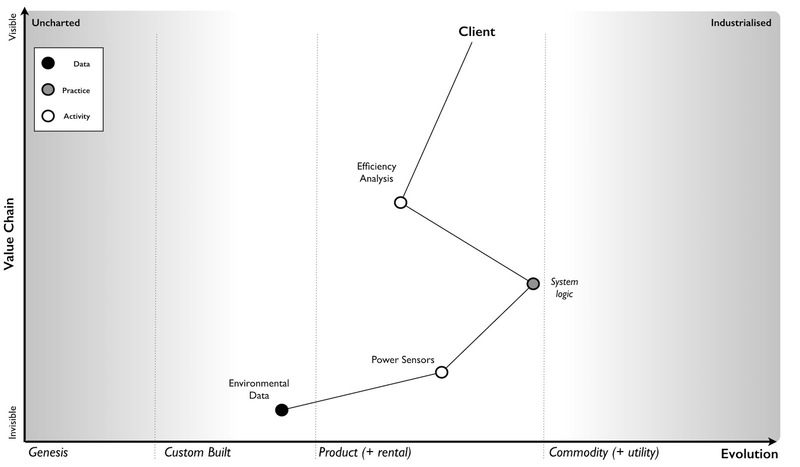 The analytics software is based upon a decade of best practice experience for the use of these sensors. The algorithms contained within the software package are considered to be the essential core IP of the subsidiary and they differentiate this product from everything else on the market. These algorithms are a carefully guarded secret. The software package also consumes a set of environmental data (which is provided by the company) that contains performance information on common hardware. The system contains a learning AI which over time develops recommendations for improving the efficiency of power use from air conditioning, air flow, positioning of equipment, type of equipment and modes of operation. It has been shown to consistently reduce 10% of energy consumption within client sites with constant active monitoring. The process of setting up a new client involves a two day installation of equipment and software on premise. The service is charged for on an initial hardware and setup cost followed by a two year renewable software license. You note that the group is clearly proud of its accomplishments, the technological marvel they have created and their ability to deliver against their vision. Next up to speak is the head of marketing. The name Phoenix inspires the ideas of regrowth, of nature and of power and this is heavily used in branding and marketing materials. The company is the largest vendor of such energy efficiency systems in Europe providing a complete service from on premise software package to sensor install. Your systems currently account for 43% of the 2016 market which is estimated at £301 million p.a. according to the latest analyst figures. The head of marketing discusses several successful online campaigns, its strong brand in the European industry and a recently run customer survey that has found a good to high level of satisfaction in over 90% of the client base. Whilst the subsidiary has some competitors in Europe, most of these are offering highly custom built solutions that are extremely expensive. The head of marketing also points to data showing the current European market is only a fraction of the £3 billion p.a. applicable market and opportunities exist in growing market share, growing the current market and also expansion overseas. In terms of growing market share, an aggressive sales and marketing plan has been developed to increase MaSh from 43% to 65% by 2021. Phoenix is considered to be the leading European technology in the space according to latest analyst reports. In terms of international expansion there are incentives for encouraging growth in markets such as Brazil which currently no-one is providing a well developed solution. The head of strategy agrees and interjects by stating "we consider this to be a highly attractive future emerging market and one the company plans to exploit". You notice the head of sales nodding in agreement. The US market is larger and considered to be more mature. 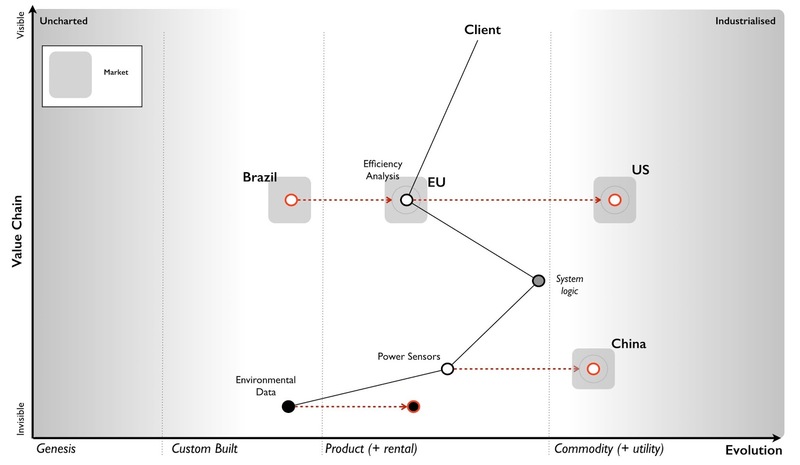 Over the last seven years there has been a software as a service offering in the US which uses the same sensor technology but with the main software package provided through a public cloud and sold on a utility basis rather than a license fee i.e. the client is only charged for when it is active and running. This has been considered successful and now commands nearly 40% of the US market. However, the US company involved has also been operating in Europe over the last five years. The competitor represented less than 3% of the European market in 2015 but their CEO has claimed in the press that they are growing rapidly and almost doubling in size each year with £15M in revenue in 2015. Though the competitor has not announced its final figures for 2016, it's estimated by some reports to be around £25M. The head of sales adds that this is not a truly digital business as it still requires install of the sensor (either by the client or through a consultancy) and connection of the sensor to the public service. They state "the US competitor might have a cloud based solution but they lack our relationships". The CIO comments that the US solution provides some features that Phoenix does not have including cross company reporting, industry analytics and a public API. There are also a number of other companies building products on top of this competitor’s public API and their CEO describes a "fairly active development community is growing around this". The Chief Digital Officer (who also runs the product group) adds that we will be building a cloud service. You sense a bit of tension here. You're aware that the organisation was recently restructured with a younger and more dynamic CDO brought into the company. The CIO (the last remaining member of the original team who founded the company) has found herself more sidelined to internal IT and data management. 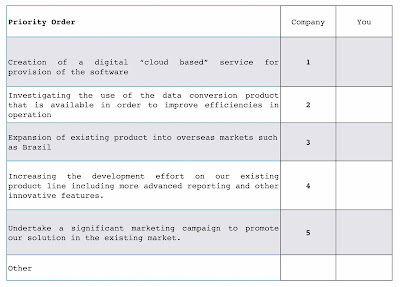 The CDO comments that there have also been recent social media stories about the US competitor "eating up" the business models of some of those product companies that have built on their API by adding similar capability into their own system. The head of sales suggests that the competitor is struggling to find its way and is being forced to resort to such cannibalistic action. He adds that "we rarely come across the US company in competitive tenders and in any case there are security concerns cited by some clients due to their cloud approach". The head of sales takes over the presentation and starts to run through the growth of the company. It's obvious that there's a lot of co-ordination between marketing, sales and digital and this team seems to be working well together. In 2016, the company had a record of £123 million in revenue with over 6,277 customers including 690 new customers, 600 pre-threshold (installed and running but within first two years before renewal begins) and 4,987 on two year renewal. The digital group have been helping in providing mobile tools, communication and other capabilities for the sales team along with marketing for more targeted advertising. The expected growth in clients is provided in figure 161. The attrition rate has been high in recent years at 9% but the Sales team believes this is due to lack of new features and a high cost of software license renewal. To combat this, the digital and product team is being expanded with a focus on new features and the renewal price will be frozen for the next two years (leading to a drop in price in real terms) with possible further reductions due to an efficiency drive. It is believed this combination should enable the company to reduce the attrition rate to 5% or less. Over the last year, the digital team has worked on improving both the social media reach, the website and the tools used in the company. The focus is now on product improvements and the development of a cloud service. This will be one of the most significant investments taken in the history of the company, starting in 2018 and intended for launch near the end of 2020 with £45 million invested. The service will be provided on a license basis in order not to create conflict with the existing model and is considered to be a counter for any future threat from the US competitor as well as necessity for a modern technology company. 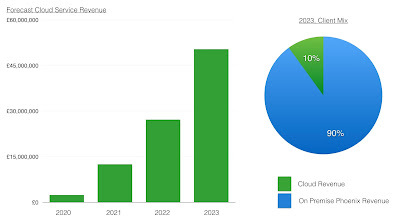 It is expected that by 2023 (three years after launch), the cloud service will contribute almost £50M p.a. 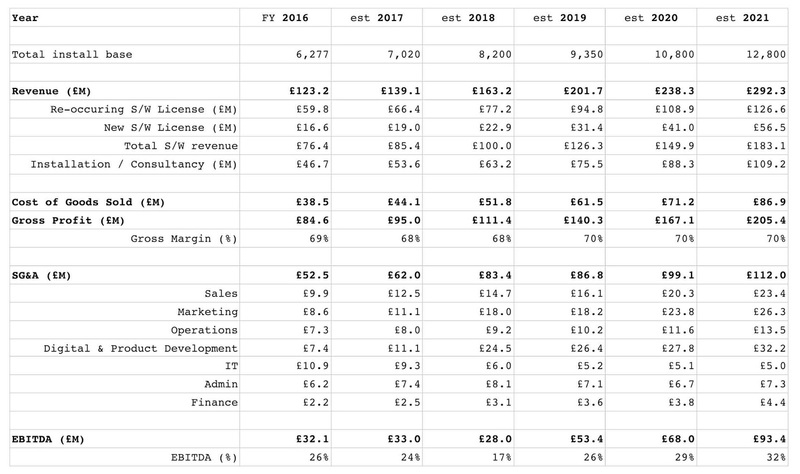 and account for over 10% of the company's revenue, see figure 162. The Phoenix cloud service will provide cross company reporting and advanced analytics. These capabilities will also be included in the on premise service. The public service will run on a major cloud provider, using emerging DevOps practices. The core algorithms and logic of Phoenix will be maintained but adapted to this new world. 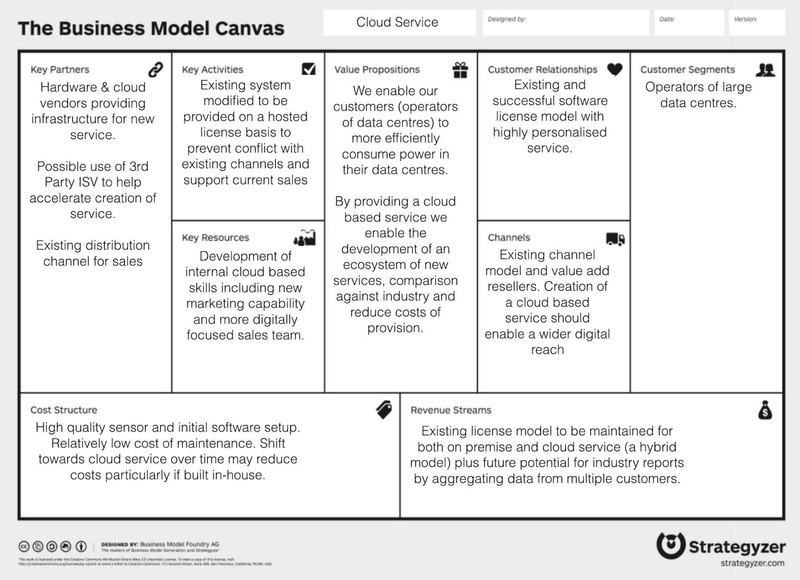 The business model was then explored including a business model canvas outlining the new programme (in figure 163). Despite the benefit to clients in terms of energy savings through efficiency that Phoenix creates, there exists some concern over the high cost of the system in the market as was noted in the customer survey. There are two potential routes for reducing the cost - the sensor technology and data costs. The sensor technology accounts for 73% of the installation charge of £67K. There is a range of new, more commodity like sensors that has been launched in China by an extremely large manufacturer. These are far simpler, vastly cheaper (about 1/100th of the price of the existing sensors) and highly standardised. However, they are also extremely basic and lack the sensitivity and capability of the sensor that Phoenix uses. The CDO points out that the product team have attempted replacing the expensive sensor with one of these cheaper versions but the performance and analysis was severely degraded making the system almost unworkable. The CIO interrupts and says that "a potential solution could be to use lots of the cheaper sensors". The CDO points out that such an approach has been discussed several times before and would require a complete rewrite of Phoenix and an entirely new set of algorithms and techniques to be developed requiring a new R&D program. The head of operations who manages installations also chimes in that it would require a complete overhaul to process and potentially an extensive upgrade path for over 6,000 existing installations. The CEO also adds that it would undermine the intellectual property developed in Phoenix. 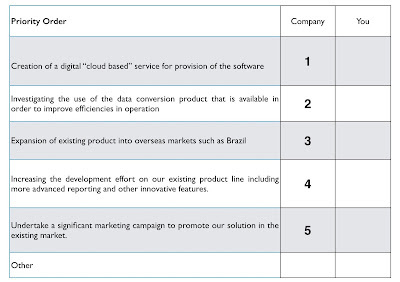 This is finally capped off with the Heads of Marketing and Sales both adding that this would create a marketing nightmare at a time of building both a new business in Brazil and a Cloud service. You sense that there is frustration with the group and the CIO and that this is a topic that has been raised many times before. However, the operations, CDO and sales head all agree that despite these cheaper sensors being not good enough for the the job that the client expects, they nevertheless think it's worth keeping an eye on the market. They are aware of the concept of disruptive innovation and how these cheaper sensors could develop. The CDO now turns to another opportunity. One of the costs to the company is in the environmental data provided in Phoenix. This data requires extensive testing and modelling of various bits of kit commonly used within data centres. Whilst this is done in-house by the IT department, there is now a data set available on the market which offers this. It is considered by the product team to be good enough and vastly cheaper than the solution from the in-house IT team. The CDO estimates that by buying in the outside data set then the company could reduce the costs of Phoenix by 3% - 4% and we should move forward with this idea. The Sales and Marketing heads agree the company should not only focus on improving our existing software package but reduce costs where possible. The CIO agrees with this assessment despite the obvious implications for IT. Expansion of existing product into overseas markets such as Brazil. Increasing the development effort on our existing product line including more advanced reporting and other innovative features. Creation of a digital “cloud based” service for provision of the software. Undertake a significant marketing campaign to promote our solution in the existing market. Investigating the use of the data conversion product that is available in order to improve efficiencies and reduce cost. These options were investigated with the wider company management team through a collaborative effort, to create a priority list (see figure 164) which was then agreed with CEO to provide a final direction. The CFO provides an overview of the company performance including a basic P&L for the company with estimates for future years (figure 165) that costs the program of changes highlighted by the strategy. 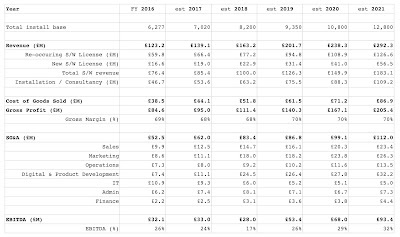 The company is profitable with a revenue in excess of £120M p.a., a 10% YoY (year on year) growth and an EBITDA of 26%. The company has a healthy cash flow and reserves. There has been a recent re-organisation in 2016 with digital combining with product development (previously under the CIO) but now run under the CDO. There has been investment in this space particularly in new technology areas within the company such as the use of social media and cloud based tools. There has also been an investment in features within Phoenix and a recruitment drive for talent. It is expected that the digital group will expand significantly over the next two years with the development of the cloud service which is anticipated for launch near the end of 2020. Though the company is experiencing growth, the investment will have a material effect on EBITDA during 2017 and 2018. There will also be a major marketing campaign around the cloud service starting in 2020. The IT function now runs internal systems and data management. It is expected that efficiency savings can be made in core legacy systems and that shift towards an external data set will reduce IT costs significantly in 2018. This will be offset by some increase due to the cost of setting up operations in Brazil. The launch of the Brazil is planned for 2018. This will include a significant marketing drive, some additional admin (HR), finance and IT costs along with increased sales costs. By 2021, it is expected that the launch of Brazil, the Cloud service along with the efficiency drive in IT will have significantly impacted revenue growth and improved EBITDA. The company by 2021 will have transformed to a more sales, marketing and digital led organisation. The CEO concludes the meeting and privately apologises afterwards for the reaction of the CIO. He explains "it has been difficult because of the changes. However, this organisation is no longer a startup and some people just have not found adjusting to this new world that easy". You ask what he plans for the CIO and he comments with a wry smile "well, Sarah did express some interest in setting up the Brazil operation but I think she knows that sometimes you just have to move on". You have a call in forty-five minutes with the executive board. That's how long you have to make your choices. The clock is ticking. So find a stopwatch and start it. Your first task is to determine whether the company is heading in the right direction. You should determine whether you agree with the priority order given in figure 166. If not, write down what your priority order would be. Once you've decided that then your next task is to determine what you say to the executive board.